Well, most women in their childhood are referred to as girls but they still fit in the category of women. In their childhood “small women” begin to learn they can control men with unexplainable powers. Small women begin to influence their fellow, “small men”, classmates into doing things for them. 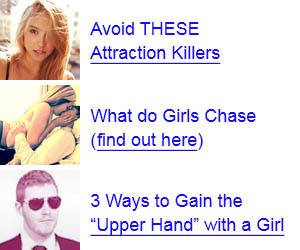 When she approaches you act normal like you didn’t read this guide, women can smell fear so stay calm. Let her put her arms around you before you touch her and when she does place one hand on her shoulder and say “Hey sweetheart I missed you” and smile, but not a cheesy smile; make it believable. She will then give you some commands such as: Get me some water, open the door, let me sit in your seat, do my homework, I forgot my lunch money today can I have yours, etc. Remember the basic rules, and follow them. That is all the help I can provide for children. Alright guys, teenage girls get needier. You already know this, but sometimes need to be reminded of it. In this stage the girl or “small woman” evolved into a lady or “woman in training.” Guys this type of women are looking for a man that will do what they want when they want and stick by their sides at all times. She’s still going to want water, and you to get the door. There are some additional needs to meet though. Now that you can drive she’s going to want you to borrow your parent’s vehicle and take her out or just drive her around. Whether you are her boyfriend or just best friend she is going to treat you the same. Once you obtain your parent’s vehicle pick her up and make sure you are not late or too early. You have to be there on the dot or she will be pissed. Make sure you take her to a nice restaurant but not to fancy. Let her order whatever pleases her; you should order for her but if you don’t know what she wants then just let her order. On the drive home don’t talk too much but let her know your still there and listening. Walk her to the door and give her a hug, no kisses guys.